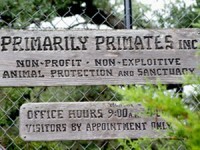 Primarily Primates, Inc. is a non-profit sanctuary in Bexar County, Texas that operates to house, protect, and rehabilitate various non-native animals. The private refuge currently houses several hundred nonhuman animals, and, as the name implies, focuses primarily on caring for apes and monkeys. Many are cast-offs from the pet trade and biomedical research institutions. 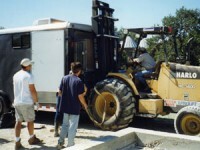 Individuals who have been accepted into the refuge include chimpanzees once used in space training and testing protocols by the United States Air Force, and Oliver, a chimpanzee once paraded on television shows as the “Humanzee” due to his habit of walking upright. Because Primarily Primates goal is to be a refuge for abandoned and formerly mistreated animals, it is not open to the public. It takes many hands to run an animal sanctuary, including care staff, veterinarians, volunteers, animal specialists and outside supporters. As the Project Oliver web series progresses, we hope to introduce you to many of the people involved — and you can read about them here. There are more than 400 animals living at the Primarily Primates animal sanctuary, representing species from around the world. 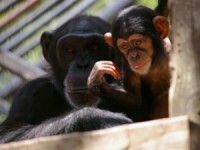 Among them are 61 chimpanzees and various types of monkeys, lemurs, birds and large cats.